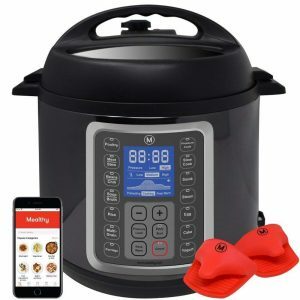 Mealthy MultiPot 9-in-1 is a programmable multifunctional pressure cooker with a 6-quart capacity. It can work as a steamer, slow cooker, cake maker, rice cooker, pasteurizer, yogurt maker, sauté maker, warmer and pressure cooker. It is a great all-in-one cooking appliance with a variety of functions. It comes with a stainless steel steamer basket and a stainless steel pot for you to make two meals at the same time. And you’ll get instant access to the recipe application when you purchase this pressure cooker. The MultiPot is a very popular best seller cooker with a rating of 4.7 out of 5 stars by 966 customers. And you’ll get a free Amazon technical support when or if you need it. You can cook a variety of meals in a matter of minutes. On the display panel you’ll find a total of 14 easy-touch programs of slow cook, rice, multigrain, soup, sauté/simmer, bean/chili, yogurt, poultry, meat/stew, porridge, keep warm and pressure cook with a manual setting. You’ll find a few useful accessories in the box including a measuring cup, a ladle, a steamer basket, silicone mitts, an extra silicone gasket, rice paddle and a 4cm-raised steam rack/trivet. The Mealthy mobile app is compatible with both Android and iOS and you’ll find useful thousands of recipes and step-by-step videos that will come in very handy. Mealthy MultiPot is easy on the eyes with a sleek and modern design, weighs 14.95 pounds and measures 13 x 12.5 x 12.2 inches- does not take up too much space for all the things that it can do for you in the kitchen. 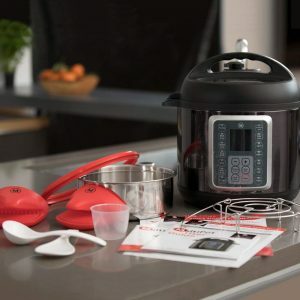 It has more functions than the similarly priced InstantPot that you may be familiar with. The cooking times are about the same for both but the MP comes to pressure and seals and relieves pressure faster than the IP. MultiPot has a slimmer look and comes with more accessories and attachments, partly because of having more features. It is engineered and designed better overall, offering a better user experience with the heat pressure settings that are easier to set. Anyone, even the beginners can use the MultiPot easily with the user-friendly presets. Most parts and accessories are safe to be washed in the dishwasher: Spoon, ladle, measuring cup, steamer basket, inner pot, silicone gasket and steam rack. The standard lid can not be washed in the dishwasher, but manually in the basin. The heat in the dishwasher can give the stainless steel a dull appearance over time. You can purchase the accessories on Amazon.com if you need to, by putting “healthy” as the keyword in the search box of Amazon. You can use most of the other pressure cooker accessories with your MultiPot. The MP Pressure Cooker is not for canning food but you may sterilize mason jars with the steam option. The Mealthy app is reported to be very useful by the customers and should not cause any troubles on your smartphone. It is a great value multifunctional cooker with a variety of user-friendly features. It offers awesome value for the dollar and you’ll get a warranty of one year by the manufacturer. But it is best you register it on Mealthy website.